Edges soft and hard. Land near and far. Colours cool and warm. These are some of the issues I am tackling in watercolour while working on the paintings of Canyonlands National Park in Utah. This section of the park is called “Island in the Sky” and even from my monochromatic sketch, you might be able to tell why. The mesa you stand on at the Green River overlook is 1,000 feet above the canyon floor and in the morning the clouds are touching land with barely any horizon visible, but the mesas you can see in the distance may be a hundred miles away. Of all the Utah parks that I have painted, this one may be the most challenging. I am almost finished the whole series and hope to post them soon. Looking forward to seeing them, Shari! What a project! Looking forward to posting them Missy. I’ve been working on them for 2 months so it will feel good to get them scanned and sent off. Beautiful. An over-used word, but in this case, very appropriate! Lee is very kind… Thanks! I love the low horizon – the sky is immense! It’s very unusual that I plan a composition that is half sky and half land but in this case I think it works. I love monochromes! Was this done using Indigo? I have a book at home with some illustrations by Nita Engle (heard of her? 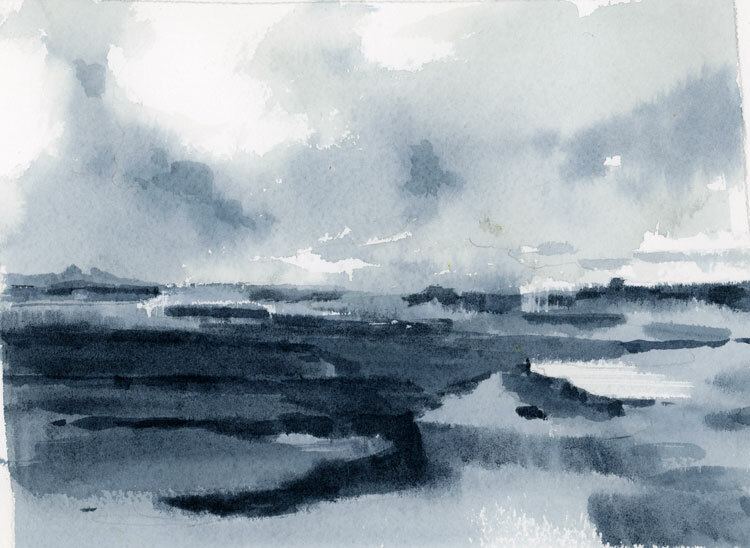 )… they are beautiful monochrome watercolours using very sophisticated and subtle shadings. Woohoo!!!! I just received my book! Beautiful! This was done using Payne’s grey but I just bought a tube of Indigo so I may try the next one using that. Of course I’ve heard of Nita Engle. There was a print of hers on the wall at the B&B we stayed in on Lopez Island. I studied it every morning during breakfast. It wasn’t completely monochromatic but almost so. Mostly blue with very subtle touches of colour. So glad to hear that you received the book and so fast. This print on demand technology is so amazing to me. I love this – so loose but captures everything! I have been to Canyonlands…a breathtaking place if there ever was one. I’ve stood above the green river and had a touch of vertigo looking over the abyss, heights make me dizzy. I can’t imagine how you got the vast landscape of this place onto watercolor paper! Love the monochrome. I was not only awed by the breathtaking beauty of the place but speechless about how to deal with it in paint. In the end, now that the paintings are done, I am very happy with the result. Might be because I had the time to think about how to deal with it. I would love to go back there.